The first system of learning music developed in the 11th century by Guido d'Arezzo. He assigned each note a name, Ut, Re, Mi, Fa, sol, and La (thus the origin of solfeggio), and designed the system of placing notes on horizontal lines to notate pitches (thus the origin of the staff). 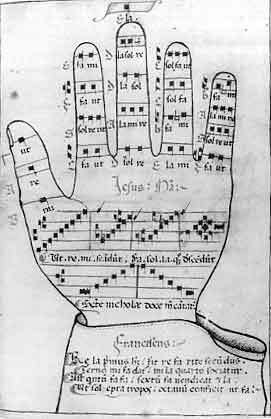 The Guidonian hand is another of his inventions, it is a system of assigning each part of the hand a certain note, thus, by pointing to a part of his hand, a group of singers would know which note was indicated and sing the corresponding note.